A red diamond weighing in at 5.03 carats. The cut is a round brilliant, but as you can see, the main kite-shaped facets on the crown are horizontally divided in two, giving the stone slightly more brilliance than a standard round brilliant. This stone was once bought at estate sale mistakenly as a red garnet! (It is not a pure red, however, there is a slight brown hue to the stone, which is what makes it appear more like a fine garnet than ruby like the Hancock Red and the Red Shield.) 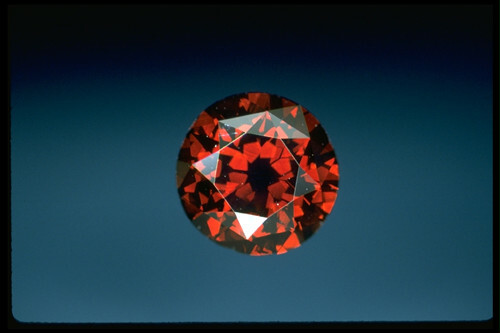 It is the third largest red diamond in the world. The second largest is simply known as the Red Diamond, an emerald cut weighing 5.05 carats. The diamond was found as a rough in South Africa in 1927, and was later bought and put in a private collection, unfortunately its whereabouts are presently unknown. The first largest is the Moussaieff Red, a very fine ruby-red diamond cut by the William Goldberg Diamond Corporation from a 13.90-carat rough and sold to the Moussaieff jewelry firm sometime around the year 2001. At 5.11 carats, it weighs just slightly more than the previously mentioned diamond. 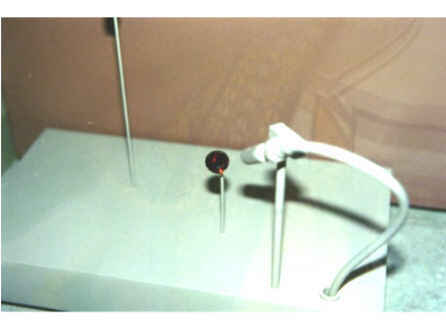 The De Young Red is in the Smithsonian Museum in Washington D.C. A red diamond surrounded by white diamonds set in brooch sold at Christie's Hong Kong auction May 1st, 2001 for about $300,000. The Fancy Red center diamond was only 0.73-carat and was I1 clarity. I am still trying to find out more about that stone. The De Young Red sitting in its display case, lit with a fiberoptic light.